Petite Vintage Style French Accent Chair - Tweed Handmade Retro. Shabby Chic. Every single armchair is individually hand-crafted by using traditional techniques for the ultimate quality;. Cover Material: Linen fabric;. Modern cylinder-shaped leg;. UK Fire Retardant Foam and cover;. Large Harrods single classic lounge chair and pouf are upholstered in a silk upholstery, deep seated, comfortable and made for a life. Set on gold / oak swivel feet - a lounge feature. From end of pouf to back of chair 156 cm (full length, horizontal view). Specialty seats maximise comfort and eliminate the need to turn or plump cushions. A high-density foam and rolled carded fibre filling ensure that the cushions retain their plump shape while also bringing a luxury feel to your living room. 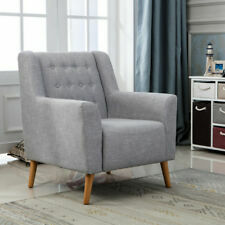 OFCASA Upholstered Occasional Lounge Tub Sofa Chair. Ergonomically, when you lean against the backrest, there is a strong sense of comfort. Quality Finish and Modern Touch - Wood light tone color chairs legs bring a modern feel. Fully reupholstered in 100% Wool Kenneth McKenzie Harris Tweed. Amblar Chair. A Comfortable Contemporary Armchair. Really comfortable and a neat size. Here we have a 20th century reading chair. Sizes = Back Height 87cm Seat Height 40cm Arm height 55cm Width 66c m Depth 70cm. now by hitting the BUY IT NOW button. Solid Oak Arts and Crafts Armchair. The chair has brown studded leather upholstery. Seat depth 36cm. Seat height 28cm. The chair has age related marks, wear and tear. Arm heights 51cm. 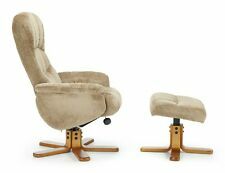 Ercol Noto Recliner 3123CM in FABRIC P102 and CLEAR OAK. Ercol Furniture Limited normally displays a range of discontinued furniture pieces for sale at our Head Office factory outlet. We also have a large exhibition of all of our current furniture designs for display purposes only. Ercol Noto Recliner 3123CM in Leather L902 and CLEAR OAK. Ercol Furniture Limited normally displays a range of discontinued furniture pieces for sale at our Head Office factory outlet. We also have a large exhibition of all of our current furniture designs for display purposes only. This is a lovely early 20th Century Antique Lounge Chair in Oak. It is raised on tapered legs with lovely swept arms. The seat back has a sunburst motif to the top with Bergere cane work to the sides. 1 x 2 Seater Sofa. Every sofa is individually hand-crafted by using traditional techniques for the ultimate quality;. Cover Material: Velvet;. Color: Grey;. Modern cylinder-shaped wooden legs;. To Sit In The Armchairs Are Comfortable. Sprung Seat & Removable Seat Pad. Springs Appear In Good Order, Tight With No Slackness. No Over Sagging Underneath, But I Have Not Removed The Hessian Lining To Full Inspect, Pressing On The Seats The Springs Are In Good Order.